More than half of the world’s population lives within metropolitan areas. Over 1.5 billion people, or one fourth of the world population, live in areas commonly referred to as “slums”. These slum areas, that lie both peripherally to the city and within the inner city exhibit a number of identifying characteristics. As an illustration, Delhi, India and Manila, Philippines are two of the most overpopulated cities in the world. The population densities of the cities, themselves, reach 30,000 to 40,000 people per square kilometers, respectively. Slum areas within these cities are upwards of 250,000 people living in one square kilometer. With so many people crammed into such a small area, it is not surprising that water supplies, adequate sanitation and health care are, to put it mildly, difficult to manage. Rundown areas of the world’s largest cities are also often characterized by substandard housing. Many people live in shacks made of tin or even wood, cardboard or plastic.. These “homes’ are hastily constructed without regard for safety or proximity to dangerous utilities and other homes. Security for the home-dwellers is often an issue and there are real problems concerning land ownership, or “tenure”. Squatter communities that spring up along the periphery of cities, and on land that was previously unused, are often illegal, but tolerated. Of course, most do not have any kind of municipal services at all. 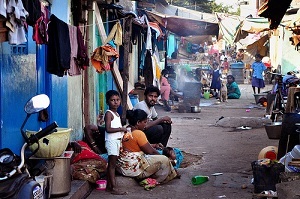 Poverty is the common characteristic of all slum-dwellers. Many people live on narrow, impassible streets that do not allow trucks, cars, ambulances, or emergency vehicles to pass. Garbage collection is nonexistent and trash accumulates continuously. The nature of a slum settlement can best be described as “informal” or “random”. There are no rules, no plans, and no rationale. Houses are often built one on top the other with too many people living in one small structure. When man-made or natural disasters occur, chaos and destruction follow, like a pile of matchsticks catching fire or a house of cards falling. There is an informal economy at work in the slum. Street vending, drug dealing, prostitution are present, as well as domestic work even to the point of recycling trash for a living. People tend to make a living any way they can, selling useable goods or stripping parts to sell on the street. There are other commonalities among the characteristics of what we call “slums”, but they may vary from location to location. Generally speaking, they are characterized by a high rate of urban decay, poverty, unemployment, and illiteracy. Social problems seem to be out of control. Crime, drug abuse, alcoholism, mental illness, and suicide are part of the lives and landscape of slum areas. A lack of health care and an increase of disease due to a lack of sanitary facilities are also seen in most slums. Many people have moved from the rural areas into the city, drawn by the prospect of more money and more opportunity. Squatter settlements often spring up in marginal areas, such as hard-to-access hillsides, ravines, and the extremes of the municipal border areas. 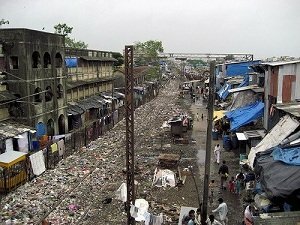 The United Nations states that the percentage of slum dwellers living in the world’s major cities has decreased from 47 percent to 37 percent in the developing world between 1990 and 2005. However, the total number of people living in urban settings has increased greatly and so the number of slum-dwellers has increased as well. The problem, therefore, of providing one and a half billion people, living in close proximity to one another, within the authority of a municipality, but without the benefits of municipal services, presents a huge challenge to bringing clean water, sanitation and hygiene to the entire world. It is not unusual for individuals to illegally tap into city water mains. They install taps in a major water delivery pipe and simply siphon off as much water as they can, distributing it or selling it in their neighborhood. It is unlikely, that the United Nations’ focus on rural development and rural solutions to the Millennium Development Goals (MGD) will provide any adequate solutions to those living in the slum colonies of the world. The people who move to the city from the rural areas often bring with them small cottage-industry skills and they try to adapt them to the urban setting. Hampered by an inadequate access to safe water; inadequate access to sanitation and other municipal infrastructure, the poor quality of housing, overcrowding, and a lack of legal home or land ownership, the new life they dreamed of becomes a nightmare. In many parts of the world, such as India, the rate of immigration into the cities from the countryside is so great and so fast that authorities have no practical way of keeping up with it. The conditions and physical makeup of slum areas makes the extension on public utilities to individuals even more difficult. Settlements, as we said, are often situated on previously unused land such as steep hillsides, ravines, floodplains and even landfills. Housing is unplanned, random and haphazard. There is no real development pattern and conditions are extremely overcrowded. Dwellings are commonly constructed of poor materials that are not waterproof, nor able to support things like plumbing pipes or electrical wire. In order for municipalities to provide water and electrical service, the cities are required to establish "legal tenure"' or who, exactly, has legal ownership of the property or dwelling. Slums are characterized by the very lack of land tenure or ownership. People show up, squat and build some kind of dwelling. Slum colonies are born and dwellings and neighborhoods are thrown together without thought given to such matters, making it impossible for local authorities to extend municipal services. Invading private or public lands with squatter settlements forces authorities to relocate slum dwellers and forces them to adhere to housing and building standards. Granting full tenure on the other hand, may cause problems like increased property prices and the encouragement of new slum development. Dwellers may simply sell their plots at a profit and squat elsewhere. In addition, there is often great opposition to relocation or the formalization of slum colonies. There has been some move toward privatization of municipal utilities in slum colonies. This requires a large capital expenditure by a private utility company and a huge investment of time and resources. But as private investment in providing these services to the poor increases, public sector investment decreases. A gap develops, then, between the amount of money needed to provide all the services, and what private investment is realistically able to contribute. Private investment has been unable to fill this gap. In addition to this, issues arise when private investors are asked to serve a “poor” sector of society. There is an expectation that the poor will not have the money to pay the bills. Cost recovery becomes an issue. The fact remains that the physical, cultural, topographic, and economic hurdles that were experienced by public utilities are also experienced by private investors as well. Informal water services are often seen in poor slum colonies where municipal and private investment have made no in-roads at all. There are some NGO’s who help set up a series of kiosks in various neighborhoods. These kiosks are fed by the NGO’s borehole well. This cooperative approach has been very successful in many places although maintenance and management issues can arise. Most of the urban population, at least in Africa, gets their water from small scale private suppliers, such as water trucks, street vendors, and other water sellers. It is not uncommon for families in slum colonies to purchase water that has been trucked in from a borehole well that is outside the city or from a neighbor close by who has water piped to their home. The owner of a borehole well may sell water to these truckers, who, in turn, will sell the water in the slum colonies and slum neighborhoods. It is notable that most of these suppliers are unregulated. The quality of the water they sell is highly questionable. There are places, for instance, that water can be sold as bottled water without ever going through any kind of purification process. As private enterprises and public entities struggle to meet the unique supply, demand, and delivery issues presented by urban and peri-urban slum colonies (including refugees and internally displaced persons [IDP] camps) one solution continues to offer the possibility of clean drinking water for every individual who chooses to participate. Household Water Treatment and Storage (HWTS) practices work in the slum colonies environment just as well as in the rural areas. Community organization and the belief that the poor do, in fact have the means for their own survival, can, through self help groups (SHG), better their own lives and the lives of their children. Self Help Groups (SHG) are associations of individuals, usually the poor in underserved rural or urban areas, who voluntarily come together to improve their socio-economic condition. SHGs are informal and voluntary groups, usually organized by government or non-governmental organizations for the purpose of empowering a particular group in society. They operate on the principles of pooling resources, accountability, mutual trust and cooperation. They usually consist of 15-20 individuals (often women, but not always) belonging to the lower economic strata of a slum colony and living in the same area. Groups can be made up of individuals having any common vision or common goal that they desire to pursue. SHGs address the financial and social requirements of their members. The group may be a business-oriented group, a family health issues group, agriculture association, a marketing group , or a group bonded together for a myriad of other purposes. SHG members deposit small savings with the group on a regular basis. As a rule, learning the importance and benefits of savings is one of the first things a SHG will embark on. This small collective savings discipline is the power of the SHG. It is possible to do much more collectively than any one member can do alone. The savings that a SHG accumulates belongs to the collective body of the SHG and can be used to meet the credit needs of the members. Group consensus is reached in making small loans to group members for specific purposes. The accountability of the group, social and familial relationships, and peer pressure all contribute to notable rates of debt repayment. Regular meetings are held where agendas are set and various transactions take place like collecting savings, issuing loans, and collecting repayments. During the initial stages, the small savings are primarily used for meeting the small consumption and emergency needs of group members. Gradually the groups will work with the local banks and other institutions to satisfy the increasing credit needs of the members as their enterprises grow and capital needs increase. As the groups mature, they yield more influence over their community and their own lives. They take part in community activities and start to participate in the improvement and livelihood of their communities. You can learn much more about the formation of Community-Based Organizations and Self Help Groups by following this link. The same technology and practices used HWTS in rural water, sanitation, and hygiene practices can be adapted to a slum colonies setting. Population density, however, and the involvement of municipal utilities become factors in the adaptation of these technologies in the cities. Municipalities may have a desire to regulate the use of water purification methods, for example. There can be a benefit to high population density when organizing SHG’s and other community based organizations. The overcrowding and larger populations in slum colonies may be an asset since it may be easier to pull them together, hold meetings, share ideas, and establish common goals, than it would be with a group of rural families who may live miles apart. Additionally, high density slum colonies represent a more viable ‘market” for any business venture that the residence may wish to embark upon. Business models involving the sale and supply of such technologies asSawyer filters and ceramic filters can flourish in an environment where hundreds of families can pool their resources and support one another in building the capital needed to purchase these household items. Similar collective efforts can be utilized to promulgate private businesses in a slum colonies with the purpose of supplying water treatment chemicals, chlorine, and clean water containers. Return "Home from "Slum Colonies"